We’re so used to seeing the youngest Kardashian/Jenner sister in multicolored wigs, we almost forgot what Kylie Jenner’s natural hair looks like! Kylie Jenner is a veritable hair chameleon. She’s gone from pin-straight fluorescent green locks to a black bob with bangs. And she somehow manages to pull off every single look. Let’s not forget the highlighter-yellow wig she busted out for Coachella this year. But there’s something even rarer than seeing a crazy Crayola color on Kylie’s head. Actually catching a glimpse of her real head of hair, that is! But the other day, Kylie gave us a rare glimpse of her natural hair on Snapchat. Her dark brown strands were pulled into a small bun on the top of her head, with hair framing her face. The reality star posed for Snapchat, pulling at the hair on the side of her head. "My hair is just so crazy," she said. By wearing wigs, Kylie avoids the damage that would come from constantly changing her hair color with bleach or dye. In a Snapchat video last year, Kylie said that changing her hair color constantly had “destroyed” her natural hair. 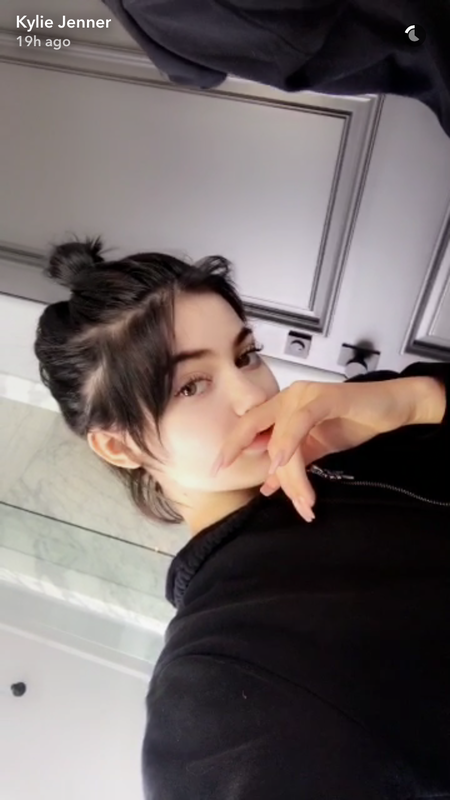 "The top of my hair is kind of destroyed from the bleach so I’m really, like, self-conscious about it,” Kylie said in the video. From her new Snapchat photos, it looks like Kylie’s natural hair is recovering nicely! And we have to say that we love her colorful wigs, too.